We all tend to suffer through the hot weather, and with this summer reaching record highs and humidity, conditions can be especially dangerous for the elderly and the infirm. For those people who additionally suffer from chronic conditions, such as diabetes or heart disease, making it through this dangerous weather unscathed takes more than just iced tea and keeping the blinds closed to keep in the cool. It takes preparation and communication. You may think that older folks are more immune to the heat, as they are frequently seen overdressed on even warm days. This is because, as we age, the ability to perspire and regulate body temperature is gradually lost, and an older person won’t feel the heat the same way that a younger person does. This doesn’t change the fact that the weather is dangerous, and precautions need to be taken. Because they can’t regulate or notice these dangers on their own, it is up to the caretaker to pay attention for signs of heat related illness. 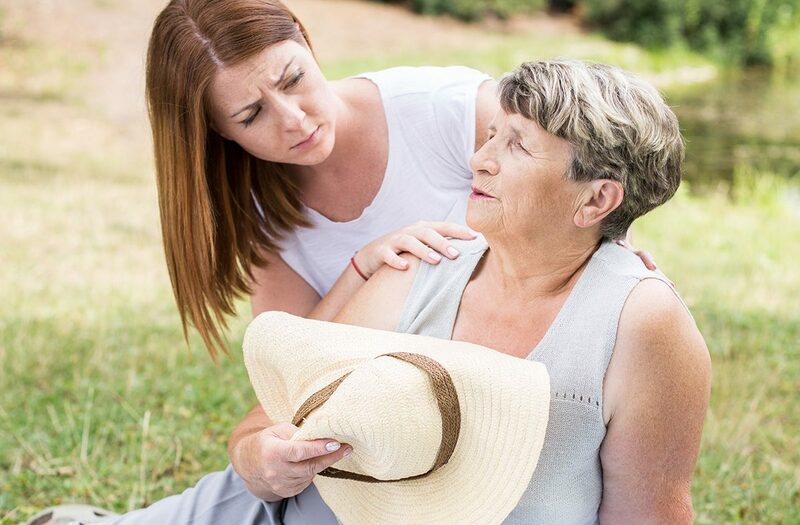 Knowing how the specific health problems of your loved one can react during times of temperature stress is a good place to start when trying to prevent episodes or even death because of high temperatures. Heart disease, for instance, makes it more difficult for the body to circulate blood properly and dissipate heat. Some conditions require medications, such as diuretics, that can hasten dehydration by causing water to leave the body more quickly. Others include antipsychotic drugs prescribed to treat agitation in Alzheimer’s, anticholinergic drugs, tranquilizers, sedatives (including over-the-counter sleeping pills), amphetamines, drugs to control blood pressure, antihistamines, and some antidepressants. Individuals that are overweight or underweight also suffer from increased risk of heat exhaustion. As in all things, preparing ahead of time is much easier on everyone than dealing with the aftereffects of a heatwave on a beloved elder. You want to know as far in advance when these weather alerts go out, so monitor the news for health and safety updates. Heatwave advisories and humidity warnings can be given up to a week in advance, plenty of time to make sure air conditioners are functioning and water is available in abundance to keep your senior cool and hydrated. Fans alone are not enough to cool down a home and given that many seniors keep their windows closed and locked for security reasons during all weather, will do nothing but move warm air around. Remember, they may not even be aware they are sweltering on the days the danger hits, so you definitely want to make an actual live appearance at their home. This way you can make sure their conditions are live-able and that they are drinking more water than usual. You can also ensure that shades are drawn, keeping harsh sunlight from baking the interior of the home, medications are being taken religiously, and your parent or grandparent’s physical condition remains good. Similarly, having meals delivered to prevent the use of stoves and/or ovens cuts down on energy costs and won’t increase the home’s temperature. Make sure your loved one is dressed appropriately for the weather. If air conditioning bothers a senior, they may balk at using it, but if you point out the availability of layers, they will be more likely to cooperate. If they simply refuse to have one, consider taking them for a short outing, like to a library, mall, or movie theater. This way, their body temperature is regulated, and they also get to spend time with you, which can be a treat. Be aware of the symptoms to look out for! Headache, nausea, fatigue are early warning signs of heat stress. Cool, moist skin, accompanied by a weakened pulse, rapid heart rate, and paleness, or muscle cramps can be indicative of heat syncope and cramps. Watch for thirst, giddiness, weakness, lack of coordination, nausea, and profuse sweating along with previous symptoms as well as contracted pupils, decreased urination and vomiting as signs of heat exhaustion. The most life threatening of these conditions is heat stroke, which requires immediate medical attention. Heat stroke occurs when body temperature rises above 100 degrees F. The person will endure incredibly hot, dry, red skin, raised pulse, and wide or dilated pupils. They may also become confused, combative, feel faint or stagger, behave bizarrely or out of character, and exhibit breathing that is fast and shallow. Delirium, seizures or convulsions, and coma are possible. When heat stroke occurs, death can occur rapidly if left untreated. Watching for these symptoms is why it is important to check in! Seriously, maintain as much contact as possible with your loved one, because circumstances through these hot days can change from minute to minute and hour to hour. Power outages occur, water runs out, meds get forgotten! The person you care for, who presumably cares for you, will often not want to “be a bother”, which is when accidents happen, and tragedy strikes. So, it can be helpful to get them texting, or even better, facetiming so you can see their physical demeaner. As this may be too much to ask for many older generations, stopping by, asking a neighbor, or having a professional health care provider drop by for regular checkups will hopefully catch any early warning signs of heat-related problems.